The idea for Seeds of Hope was conceived when Bishop Jon Bruno was diagnosed with leukemia and admitted for his final treatment at City of Hope. Though not his patient, he met endocrinologist Raynald Samoa, M.D. who was covering rounds. The two men spent over two hours talking about food related illnesses, food access issues and disparities of food health in communites. Dr. Samoa also knew Alderson, who was working on a farm project for City of Hope. 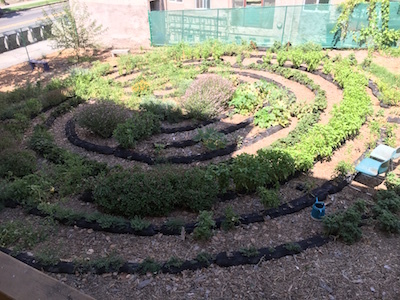 The Living Labyrinth at Edendale Grove Parish Garden constructed with the help of non-profit Our Foods is part of Seeds of Hope. Photo Credit: Seeds of Hope. To achieve this, over 80 institutions of the Diocese of Los Angeles are directly involved, have gardens and are distributing food to those in the community. “More than three quarters of our congregations are now growing and/or distributing food,” Alderson says. They have also partenered with the Los Angeles County Department of Health to provide garden-based nutrition education along with cooking classes in low-income communities around L.A. County. Alderson developed the Diocesan Food Policy to give the clergy tools to connect the importance of these issues to the core value of the church. It was adopted because they felt it was “an inspiring issue that connected directly to what they do in their work. It has been very effective,” Alderson says. 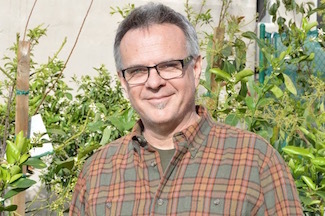 Alderson grew up on a farm in Salinas and spent most of his life in farming, including owning a soil amendment business and helping to found the California School Garden Network, which he ran for its first five years. Seeds of Hope has made a significant impact on the community. It grows fifty tons of fruits and vegetables, resulting in 800,000 servings of food per year, the provision of food to approximately 30,000 households per month through food pantries, and over 30,000 meals per month to people in need at various meal programs.